What Are Red & Black Bugs on My Plants in Florida? Florida's warm, humid climate provides some of the best growing conditions in the country for many popular ornamental plants, but ample foliage also attracts insects that feed or live on prized trees and flowers. Identifying the red-and-black insects on your Florida plants is particularly challenging because of the range of possibilities. Once you identify the pests, you can determine the best course of action for their management. Not all black-and-red insects are signs of trouble for your plants. One beneficial native Florida bug is Jadera haematoloma, commonly known as the red-shouldered bug, soapberry bug or goldenrain-tree bug. The species is attracted to several popular ornamental trees. Red-shouldered bugs average 1/2 inch long and feature a bright red, oval-shaped body with black shoulders and legs. The bugs eat the seeds of some invasive tree species and keep your yard free of unwanted saplings. Ladybugs or lady beetles are also welcome in Florida gardens; the black-spotted, red bugs feed on other garden pests. These bugs don't harm plants, so control is unnecessary. Some black-and-red Florida insects won't destroy your plants or injure you, but they can cause infestations in your home and alter the appearance of plants. The box elder bug is a common Florida pest that releases a pungent, staining secretion when threatened or disturbed. The secretion isn't dangerous, but it may discolor plants or the walls of your home. Box elder bugs have long, black oval bodies with angular red streaks. Vacuum up nuisance box elder bugs or, if necessary, spray boxelder bugs with a ready-to-use insecticidal soap. Spray plants thoroughly so the spray covers the bugs completely. Some black-and-red Florida pests are a risk to plants and members of your household. Several wasp species that are black and yellow in other parts of the country have black-and-red coloring in Florida. Black-and-red wasps pollinate your garden plants, but their stingers threaten people who accidentally disturb them. Florida is also home to black-and-red carpenter ants. These nocturnal ants are not a stinging threat, but they feed aggressively on plant leaves and may infest living areas as well. Cleaning up moist garden debris such as wet leaves, wood or plant parts will eliminate the ants from garden areas. Eliminating harmful insect species in your garden may be helpful for maintaining the health and safety of your plants, but Florida enacts strict policies regarding pest management, particularly in environmentally protected areas such as the Florida Everglades. Many pesticides that are federally approved for use in other states are restricted in Florida. Never use products not approved for Florida home use or for the specific plants and red-and-black insects involved. Wear gloves, protective clothing and protective eyewear whenever you use chemicals of any kind. 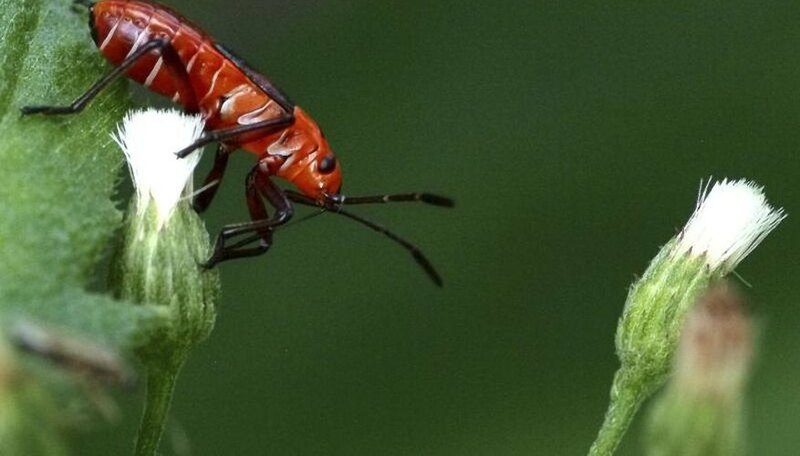 University of Florida: Red and Black Bugs Bugging Your?